The first Roma that arrived to Istanbul in the year 1000 settled here: the city still was called Costantinopolis, and the Ottomans hadn’t conquered Anatolia yet. They built their houses next to the wall that closed the city between the Bosphorus and the Golden Horn. 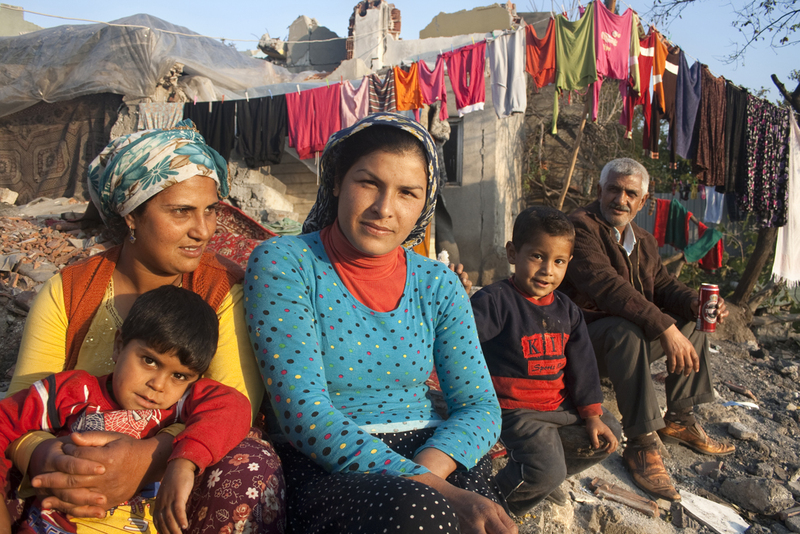 After a thousand years living together with the greek, armenians, hebrews, turks and kurds who inhabit the city, the neighborhood of Sulukule was the first victim of the ferocious wave of gentrification that is promoting at once globalization and turkeyzation of the city. A 2005 law conceded to local administration and to the “TOKI”, the enormous national institute for mass housing, the possibility of intervention in historical sites: the ancient gypsy neighborhood was declared “Urban Renewal Area”, and its inhabitants forced to relocate in enormous blocks more than 30km far. They even faked the constitution of a puppet neighborhood association to support the demolitions. The houses were marked with big “X”‘s as a measure of pressure, and the ruins were left on the site to force neighbors to leave. A powerful public campaign against the evictions had the story known to the international public: activists even studied an alternative plan. 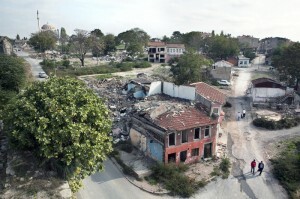 Authorities declared themselves interested in a negotiation, but meanwhile they kept demolishing: in two years, nothing was left in Sulukule except for rubble. Soon the construction of the new residential neighborhood on the site will be finished; meanwhile, many of the former residents left the flats they had been relocated to, and went back to barracks close to where Sulukule was. More stories from Turkey: The Revolt of Anatolia on Vimeo, video about the protests against hidroelectrics that are menacing the rivers of Anatolia. En la otra orilla del río Evros, on Diagonal, about immigrants crossing the border between Turkey and Greece to reach northern Europe.